Unfortunately our email subscription facility – which sends out emails when posts are made to the site – seems to have gone haywire and we have had to suspend it until we figure out what is going on. Apologies. This entry was posted in Announcements on 24th April 2015 by Hugh Pemberton. The weekend edition of the Financial Times has a debate on pensions between Alan Higham of Fidelity Worldwide Investment and the the Thatcher’s Pension Reforms project. Principal Investigator, Thatcher’s Pension Reforms project. This entry was posted in Pension freedom, Pension history, Pension mis-selling, Pension security on 4th April 2015 by Hugh Pemberton. Thatcher’s Pension Reforms has received a gratifyingly large amount of traffic over the past week as the budget loomed. The project has only been going a few months and is very much in ‘information gathering’ mode at the moment, so we did not feel able to contribute directly to that debate in any detail. However, we do hope to issue some interim findings within a few weeks, so please sign up for email notifications, or follow us on Twitter at @tpr1980s. In the meantime, here is an initial statement of intent. Nonetheless, looking more generally at more than a century of pension reform in Britain it is easy to highlight at least two key ‘lessons of history’ to be borne in mind when reading the Chancellor’s 2015 Budget Statement. First, there is always a tension between ‘freedom’ and ‘safety’ when it comes to pensions. Freedom for the individual consumer has its virtues but the experience of many decades is that many (if not most) consumers are ill-equipped to understand the complexities of ensuring a constant stream of income from retirement to death. The findings of the First Report of the Pensions Commission in 2004 (pp. 208-9) have not been magicked away over the past decade: people are not good at estimating probabilities or understanding risk, they shy away from complexity and from products they don’t understand, and when they don’t they are easily influenced by those who present their options to them. Bearing in mind this lesson, ‘pensions freedom’ (i.e. the freedom to cash in an existing pensions annuity coupled with the Chancellor’s removal of the 55% tax constraint on doing so) could prove unwise over the long term and the warnings from pensions professionals about this should be listened to. This is not about buying Masaratis with the proceeds, it is about people making important financial decisions about complex issues that they are ill-equipped to grasp and the risk that they will be taken advantage of. Much will turn on the quality of independent advice on offer from the new Pensions Wise service. Ultimately, however, what people want is the security of knowing they will not suddenly find themselves without adequate income at the end of their life: i.e. what they want is an annuity, they just want a better rate than they’re getting at the moment as a consequence of quantitative easing. To this extent ‘pensions freedom’ is something of a red herring. Second, choices on pensions are the most long-term of all public policy decisions and this exceptionally long-run horizon does not sit easily with the short-run priorities of day-to-day politics. Decisions made for the short-term can have unexpectedly large long-term effects. 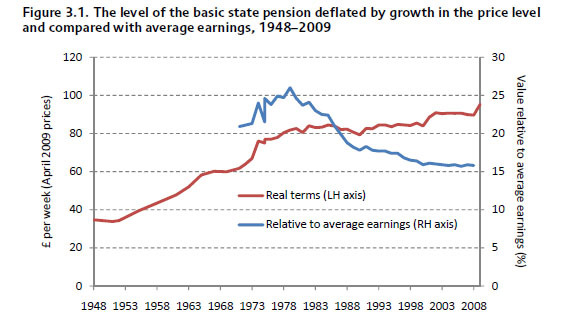 The change from indexing the basic state pension to prices rather than earnings is a case in point. Introduced in 1980 to get the State off the hook of mounting costs at a time of concern about public spending levels it had marked distributional effects over time – as can be seen in this graph from the IFS’s History of State Pensions in the UK, 1948-2010 (p. 13), the value of the BSP relative to earnings falling by about 40% over the ensuing quarter of a century. In this context, the Chancellor’s decision to reduce the lifetime allowance from £1.25 to £1 million and then to index that sum to CPI from 2018, if sustained over many years and if we return to a world of consistently rising real incomes, would over time work substantially to reduce the value of that allowance relative to earnings (real incomes growth of 3% p.a. over a quarter of a century would nearly half this ratio). In short, the Chancellor may turn out to have introduced a measure that will over time effect a surprising number of people. This entry was posted in Pension history, The Budget on 19th March 2015 by Hugh Pemberton.